Book with a deposit of £100 per person. Cut short the cold UK winter with two weeks of pleasant sunshine, courtesy of our February 2020 Florida holiday. Fly direct to Orlando from Manchester or Gatwick, pick up your hire car and drive 20 minutes to the Rosen Inn at Pointe Orlando. 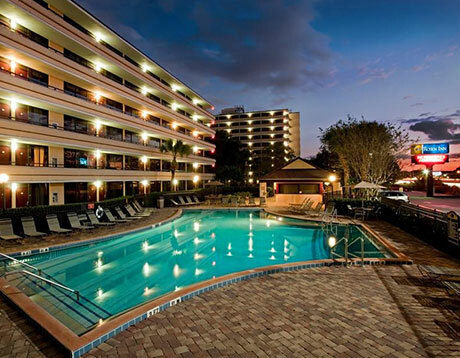 This comfortable, budget-friendly hotel is close to Florida’s top attractions. Fine dining and world-class shopping are a short walk away. This well-priced holiday works even on February 2020 half-term dates as long as you depart Monday to Thursday. Friday or Saturday departures add slightly to your costs. This February 2020 Florida holiday includes direct flights to Orlando from Manchester or Gatwick. We book all major airlines. Virgin, British Airways and United are popular choices on this route. Let us know if you prefer to fly from your local airport. We have well-timed connections from Aberdeen, Edinburgh, Glasgow, Isle of Man, Jersey and Belfast. Fare supplements are small. This February 2020 Florida holiday includes a Midsize SUV. Pick-up and drop-off your vehicle at the airport. Enjoy your February 2020 Florida holiday at the Rosen Inn at Pointe Orlando. 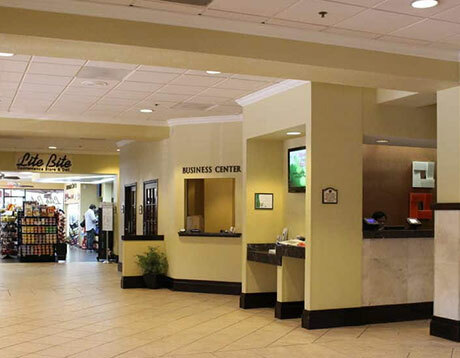 The Rosen is a budget-friendly hotel 15 miles from Orlando International. Conveniently located on International Drive, world-class dining, shopping and entertainment is on your doorstep. You are handy for Universal and Disney. The hotel has free gated parking, free shuttles to Universal, a mini-market, sports bar, family restaurant and three swimming pools. Rooms are clean and comfortable; facilities include an en-suite bathroom, free Wi-Fi, flatscreen TV, mini-fridge and microwave. 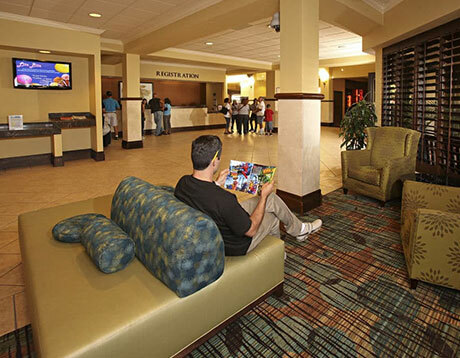 The family-friendly hotel is a popular choice for Florida holidaymakers. Over 8000 reviews on TripAdvisor average at 4 stars. Our February 2020 Florida holiday includes direct flights to Orlando, fully insured vehicle hire and two weeks at the Rosen Inn at Pointe Orlando. Prices start at £725 per person, based on a family of 2 adults and 2 children. Book now with a deposit of just £100 per person; balances are payable 90 days before departure. This February 2020 Florida holiday is a great option for budget-conscious holidaymakers. But if it doesn’t appeal, why not get in touch and let us know your requirements? We can put together any Florida holiday to suit your requirements. All of our Florida holidays are ATOL and ABTA protected. 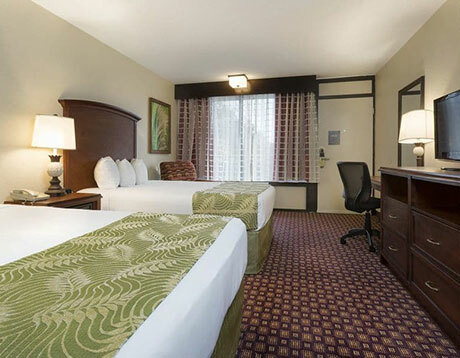 If a fortnight in Orlando doesn’t appeal, why not consider one of our twin-centre offers? Our January 2020 Florida holiday includes a week at Encantada in Kissimmee, followed by a week at Sunset Vistas Beachfront Suites in St. Pete's. After a week at the theme parks, spend a few days relaxing on the white sands of the Gulf Coast beaches. Stroll the promenades, browse the boutiques and indulge in delicious, fresh seafood. Book on deposit, ATOL / ABTA protected. Florida really comes alive in the Easter season. It’s the perfect time for a family holiday – warm, sunny days are perfect for strolling around the attractions. Combine a flight with your choice of accommodation and a fully-insured vehicle. We have lots of options for parties of all sizes. Don’t delay – book asap for a good choice of flights and accommodation. Planning a February 2020 Florida holiday but not sure where to begin? Start with our February 2020 Florida Flights page - it's jam-packed with useful information such as the best travel dates and how to achieve the best fare. We have rates for all the popular carriers, including Virgin, BA, United and Norwegian. Book today with a low deposit. ATOL and ABTA protected.